(From left) Minister of Utilities Dato Sri Dr Stephen Rundi, Rina, Abang Johari and Deputy Chief Minister Datuk Amar Douglas Uggah pose for a photo call before their meeting. KUCHING: A total of 105 rural development projects costing RM916 million will continue to be implemented in Sarawak this year, said Rural Development Minister Rina Harun. 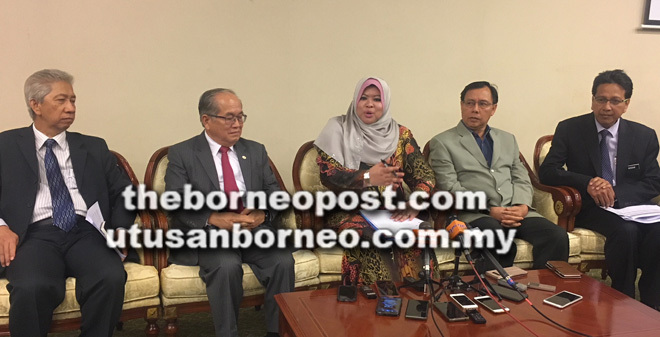 Speaking to reporters after meeting Chief Minister Datuk Patinggi Abang Johari Tun Openg yesterday, she gave assurance that rural development projects in Sarawak will continue, contrary to earlier news reports which had stated otherwise. She disclosed that only a road construction project in Tanjung Batu in Bintulu costing RM2 million will be deferred to next year. Although the ministry is reviewing many projects in the past two months, she said they agreed to continue the 105 projects which are of benefit to Sarawakians. “We agreed to establish a committee to coordinate projects in Sarawak. We do not want anymore overlapping of projects by the state and federal governments. “We also want to make sure these projects that we planned will be expedited through close relationship between both governments. These projects include rural water supply, housing, and electricity supply which are priority to the state government. “We in Pakatan Harapan government are more people-centric, and we adopt the bottom-up approach. We do not want anymore wastage or projects that do not give benefits to the people,” she told a press conference after a courtesy call on the Chief Minister at the State Legislative Assembly complex here. Rina was here as part of a three-day working visit to Sarawak – her first official duty to the state since appointed to the post three months ago. She hoped that the visit will put to rest the confusion caused by a news report which misquoted her on her remarks regarding Sarawak, which had upset people in the state. She said the newspaper which published the report had apologised for its error. To a question, she said she will definitely visit Sarawak again to tour the rural areas in December. “We are going to have a core meeting with the state government in December, and then visit the outskirts and rural areas in the state. Rina (centre) gestures as she talks to the reporters. Also in the photo are (from right) Azizan, Dr Rundi, Uggah and Chaiti. Deputy Chief Minister Datuk Amar Douglas Uggah Embas, who was present, quipped that Rina will be spending the night at a longhouse during the visit. Uggah, who is also Minister of Agriculture, Native Land and Regional Development, thanked Rina for making the official visit to Sarawak and to clarify matters regarding rural development in the state. “We have been waiting for her visit. For Sarawak, rural development is crucial because some 40 per cent of our population still live in rural areas. “The state government is intensifying rural development programmes with its own funds. Following the visit of the Rural Development Minister, we can now coordinate the projects to avoid any overlapping. “We are thankful that a coordination committee is being established again. It will be chaired by me and YB Rina, to ensure planning of projects will be streamlined and to make sure these projects really benefit the people, especially in elevating poverty, to improve their socio economic wellbeing and to narrow the gap between urban and rural areas,” he said. Also present at the press conference were Minister of Utilities Dato Sri Dr Stephen Rundi, Rural Development Ministry deputy secretary general (development) Dato Azizan Mohd Sidin and special administrative officer in the Ministry of Agriculture, Native Land and Regional Development, Datu Chaiti Bolhassan.